The late Audrey Engelhart continues her lifelong passion for saving animals through a bequest. "She got her first pet, a cat, when she was two years old. From that moment on till the time she passed away, she was never without a cat, and sometimes more than one," remembered Judy Bartow of her best friend, the late Audrey Engelhart. Inspired by a lifesaving operation performed on one of her cats, Casper, by an LSU School of Veterinary Medicine team, Engelhart shared her passion for animals through making a bequest to the School of Veterinary Medicine. The Audrey Engelhart Shelter Medicine Endowment will enable the school to educate students within the Shelter Medicine Program on the importance of shelter medicine to local communities, and it will broaden the scope of services made available to surrounding shelters. With the financial resources provided through the endowment, the program can produce real-time results by improving the trap, neuter and release program and increasing the number of shelter animals made available for adoption. Originally from Alexandria, La., Engelhart moved to Baton Rouge in the ‘80s to be with her husband, Gerald Engelhart. 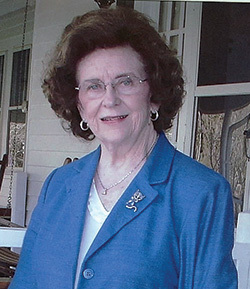 She passed away in 2014 at the age of 90 years old, and Bartow served as the executor of her will. She described Engelhart as personable and kind, and a lover of shopping, traveling and Disney World. Throughout her life, Engelhart devoted herself to helping all in need, humans and animals alike. Bartow said Engelhart's philosophy was "There's never a wrong time do the right thing." "One time, she was walking down the street, and she saw a lady hitting a dog. She went right over, and she said, ‘You tell me where you live, and I'll come and get that dog tomorrow.' And she did! She went and got the dog, took care of it and found a home for it," Bartow said. "She couldn't bear to see an animal mistreated. Not a lot of people would do that." Engelhart also cared for two generations of feral cats near her home, leaving food and water outside every morning for the cat colonies. One day, a cat invited herself into Engelhart's home and never left, becoming Engelhart's final pet. Now, Baby Girl, as Engelhart affectionately named her, is in the care of Bartow. "She wished she could save them all, but she knew she couldn't," Bartow shared. "She just wanted to help and find a way to gain control of so many unwanted animals, which is a universal problem." Engelhart's gift to the School of Veterinary Medicine, which is one of only 30 veterinary schools in the U.S., will continue her mission of animal rescue and care. In addition to the endowment, the two Audrey Engelhart Scholarships in the school will provide financial aid for full-time veterinary medicine students. Assistant Professor Wendy Wolfson called the endowment "invaluable," explaining, "How can you put into words the impact of many more years of service for south Louisiana shelters? Who would perform needed medical services for the animals? Who would fight to make shelters more humane places? Who would instill in students the importance of helping animals with no voice?" Wolfson said. "The Shelter Medicine Program impacts the lives of thousands of pets now, tomorrow and years into the future. We may never know the full impact of Mrs. Engelhart's gift, but I can say with confidence that it will change animal lives for the better and make hundreds of students aware of the fate of shelter animals who do not receive veterinary care. I truly cannot thank her enough."